Buffalo wings (or just “wings” if you are a native Buffalonian) are one of the few modern dishes that have become staple food in bars and fast-food locations around the country. And as with most dishes, it has a muddy history, with two groups claiming to be the creator of the original “wings” served in Buffalo. The current title holder of “wing creator” is Teressa Bellissimo. The story goes that some time in 1964, Teressa’s son Dom asked her to whip up a snack for his friends, and she quickly fried some chicken wings destined to be used in their chicken stock, and then coated them in a spicy red sauce. This has been the go-to origin story since wings became popular in the 1970s. But John Young had a different story to tell. Young moved from Alabama to Buffalo in his teens and says he began selling chicken wings out of his restaurant “John Young’s Wings n’ Things" in 1964 until he closed up shop when he moved to Illinois in 1970. Most importantly, Young mentioned in interviews that chicken wings were traditionally eaten by poorer, rural African American communities, such as the one he grew up in in the South. These poor families were more apt to use the entire bird, and would not have discarded the wings. What’s most interesting of all is that when the original declaration for Wing Day occurred back in 1977, John Young wasn’t named as the creator of buffalo wings. But neither was Teressa. Instead, the honor went to Teressa’s husband, Frank. To make the buffalo sauce, combine all ingredients in a small saucepan. Bring to a simmer. Simmer for 2 minutes. Remove from heat and set aside. Preheat your grill for high heat (450ºF) direct grilling. Season the wings with the salt and fresh ground black pepper. Grill until the internal temperature surpasses 165ºF, and the outside is has nice grill marks and char. Remove from the grill. Place in a mixing bowl. 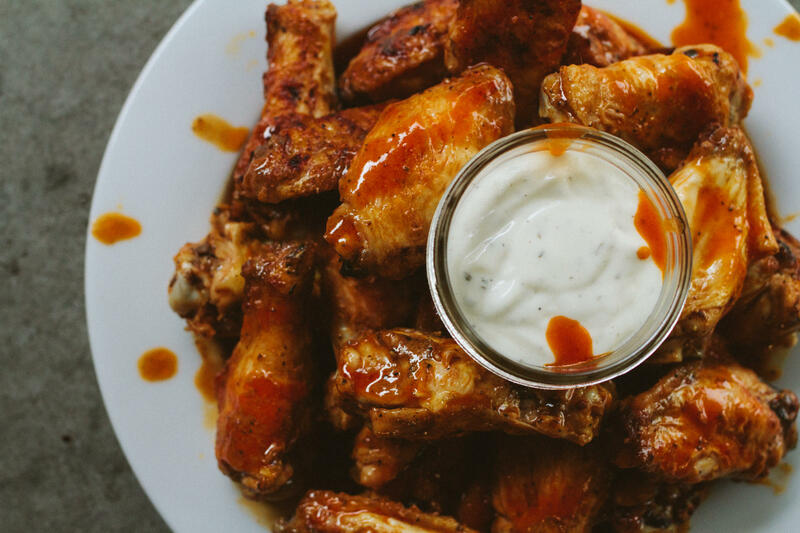 Add enough buffalo sauce to the bowl to coat the wings. Toss to cover wings in the sauce.